The days are starting to get a little shorter, the mornings a little cooler and daylight-saving is this weekend, a sign if ever there was one that Summer is officially over. Though March has proved to be a little bit of an Indian Summer, glorious sunshiny days and I think when we get them at this time of year we appreciate them so much more than at the high of Summer when our expectations are so much higher. Each sunny day now is a bonus to be savoured before Autumn and Winter set in. One thing about the cooler climes is soup. I am a fan of soup, all sorts of soup. One of life's simple pleasures and so simple to throw together. Vegetables, water and just a little seasoning can be transformed in to a bowl of nourishing comfort that can satisfy, rejuvenate, hearten and even fight off colds and flu. Mum always has a freezer full of all sorts of soup; lentil, broth,celery (seriously good), broccoli perhaps spiked with a little cheese. 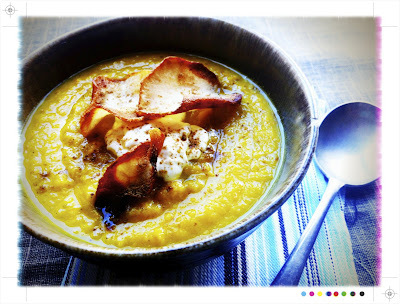 My favourite remains her lentil soup which no matter how hard I try I just can't quite replicate. 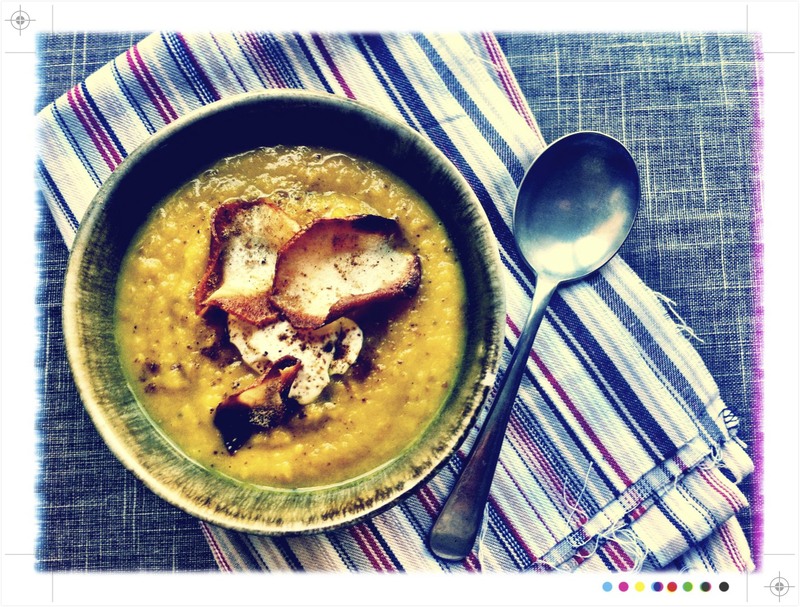 A good, even great, lentil soup I can make but is just not quite the same. So every time Mum visits form the mother country top of the list of to do is to fill my freezer with a batch of her lentil soup to tide me over until her next visit. My Gran would also always have a batch of soup on the stove and her piece de resistance was her potato soup. On visits home there would always be a bowl of potato soup. Sadly we have no recipe but Mum has been faithfully trying to replicate it and we now have a recipe cobbled together so watch this space as it will most definitely feature this Winter. The key ingredient for Gran's potato soup....good lamb stock and by that I mean lamb stock made with leg of lamb!!! 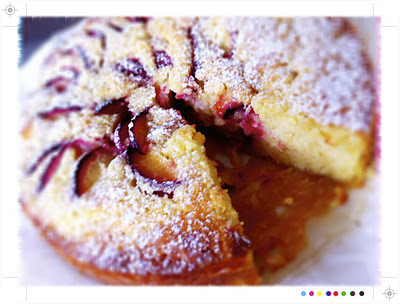 I kid you not, it is not surprising that it tasted so wonderful. The first soup of the season came about due to a few parsnips loitering in the fridge and I recalled an old Delia Smith recipe; curried parsnip soup. Bright and fragrant it is warm and satisfying. Heat a small skillet over a a medium heat and add the coriander, cumin and cardamom seeds. Toast them gently for a moment or 2 until they release their aromas. Keep a close eye on then as you don't want them to catch and burn. Once toasted grind them in a pestle and mortar and set aside. In a large saucepan heat the olive oil over a medium heat and add the onion. Season with a pinch of salt and saute for a few minutes until translucent, about 5 minutes. Add the garlic and sauté for another couple of minutes. 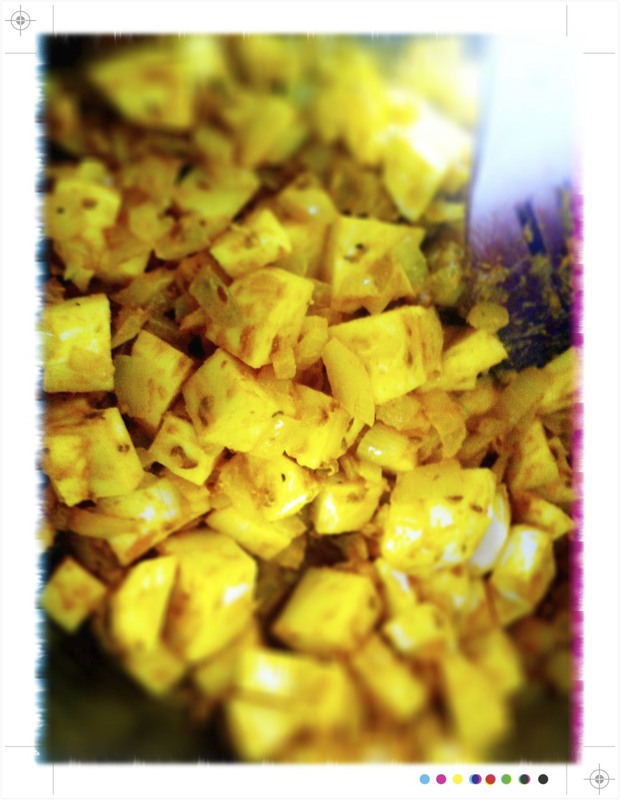 Add the ground spices, turmeric and Dijon and give it all a good stir. Cook gently for a couple more minutes and then add the parsnips and stir again. Add the stock and season with salt and pepper. Simmer on the lowest possible heat for 1 hour uncovered. After an hour liquidise the soup in a blender or with a stick mixer. Taste and adjust seasoning if need be. Just before serving heat up the soup and then grate in the apple and let it simmer just for a moment or 2. 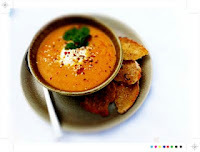 Ladle the soup in to bowls and top with a dollop of sour cream, a few parsnip crisp and a sprinkle of chaat masala*. 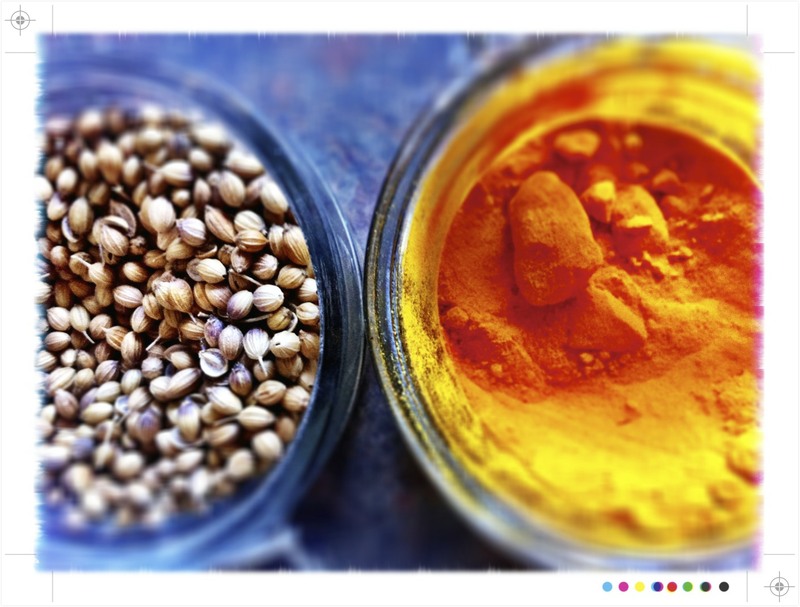 *Chaat masala, a totally addictive Indian spice mix that can be sprinkled over just about anything. It is usually a mixture of dried mango powder, cumin, black salt, coriander, ginger, salt, black pepper and chilli powder. It is sweet and sour and delicious. 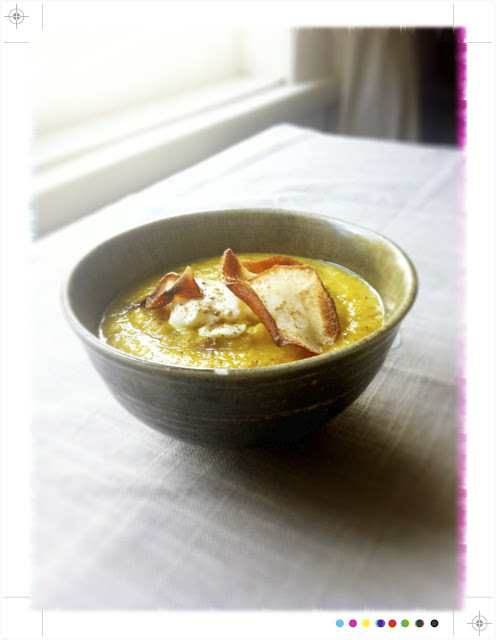 The turmeric gives the soup a wonderful vibrant yellow hue and the apple adds just the right amount of sweetness to complement the sweetness of the parsnips. 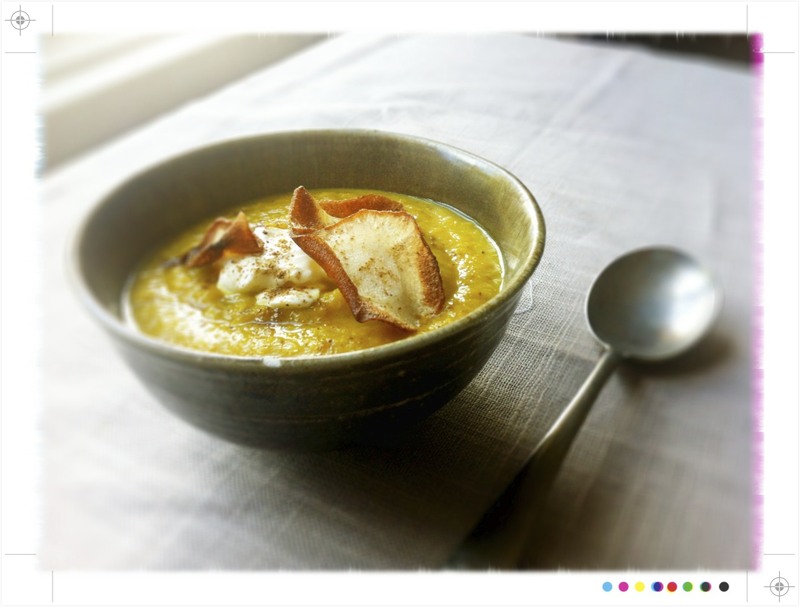 All the spices add a depth and warmth that make this soup so comforting, topped with a little sour cream, crunchy parsnip chips and a dusting of chaat masala make it a whole meal in a bowl. 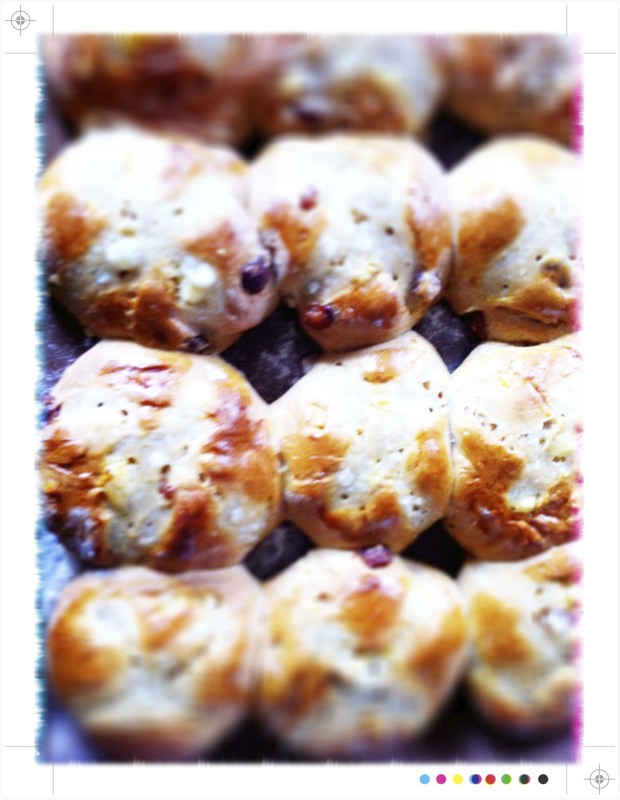 Easter really wouldn't be Easter without hot cross buns. I did attempt to make them myself last year but I ended up with what would have been quite effective land to air missiles, more rock cross buns than hot cross buns. * I am very happy that this year they are not only edible but actually very good. I like their spicy, fruity not overly sweet flavour and fresh out the oven, butter melting they are hard to beat. The would definitely be my preference over Easter Eggs. Don't get me wrong, I love chocolate but I veer to the dark, bitter end of the spectrum where a little of the good stuff is enough to satisfy my craving. I have never been one for overly sweet, even as a child I didn't really like Cadbury Cream Eggs, a gooey sugar laden white and yellow goop encapsulated in milk chocolate was just too sweet. I just ate the gloopy sugary filling and that delivered more than enough of a sugar rush. As an adult Easter Eggs could remain in the dark recesses of the pantry for months on end and never see the light of day until the bi-annual pantry clear out. *So, I can't emphasise enough if you don't think your yeast has bloomed start again! Place the milk, butter, orange zest, clove and cardamom pods in a small saucepan over a low heat, just warm enough to allow the butter to melt. Remove from the heat once the butter is almost melted as it will continue to melt off the heat. Set aside to cool and leave to infuse for 10-15 minutes. Add the flours, salt, cinnamon, nutmeg, ginger, glade fruit and sultanas to a the large bowl or a the bowl of a stand mixer. Once the milk has cooled remove the clove and cardamom pods and then gently beat in the egg. While the milk is cooling add the hot water to small bowl, add the honey and stir to dissolve. 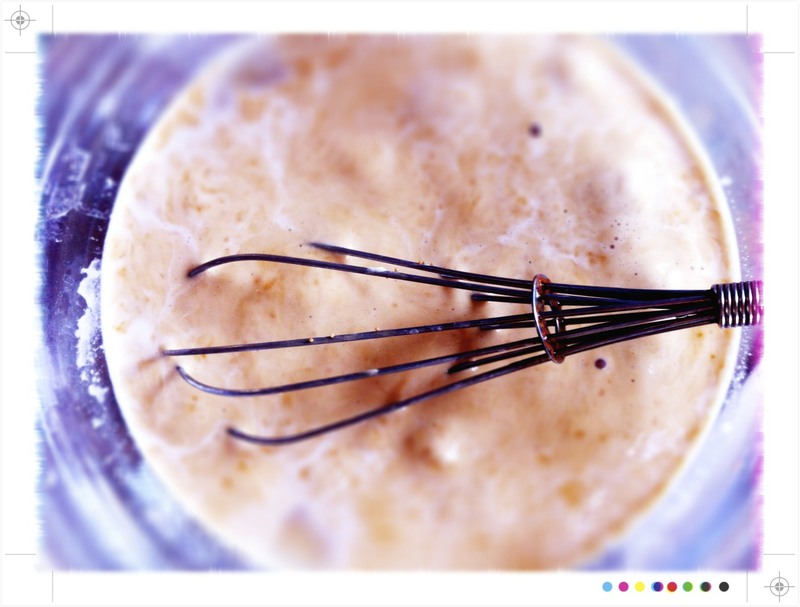 Whisk in the yeast and set aside for 5-10 minutes to let the yeast bloom. If in doubt start over as no blooming will lead to inedible rock cross buns. Add the yeast and milk mixtures to the dry ingredients and then knead the dough either by hand or with the dough hook of an electric mixer. 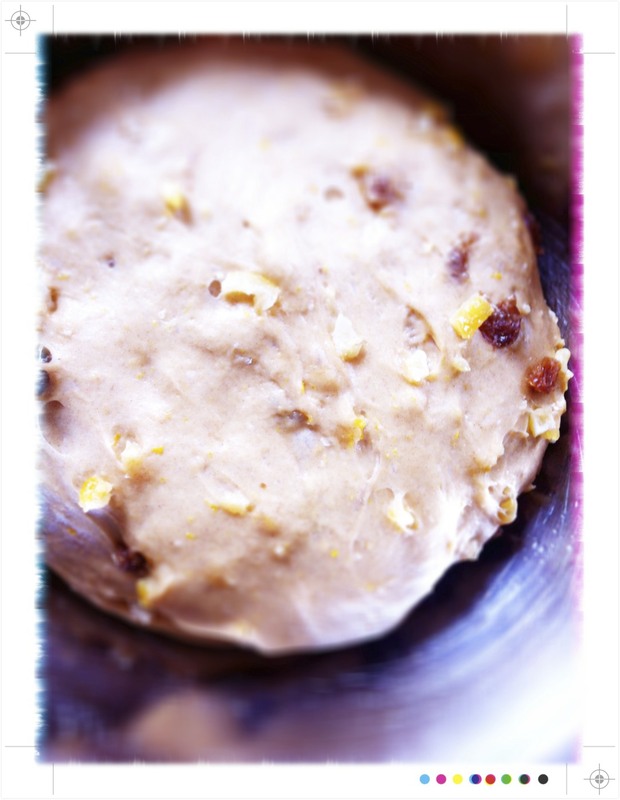 Knead the dough until it is smooth and elastic, about 5 minutes in the electric mixer. Place the dough in an oiled bowl, cover with cling film and place it in a warm cosy spot to rise for 1- 1 1/2 hours until it has double in size. Gently punch the dough and turn it out on to a lightly floured surface. Knead the dough again for a few moments and then divide it in half and then half again. Divide each quarter in to 4 and roll each in to a ball, it will be about the size of a ping pong ball. 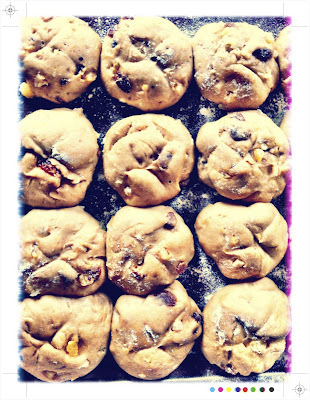 Place the buns on a lined baking tray, not touching but close is fine. 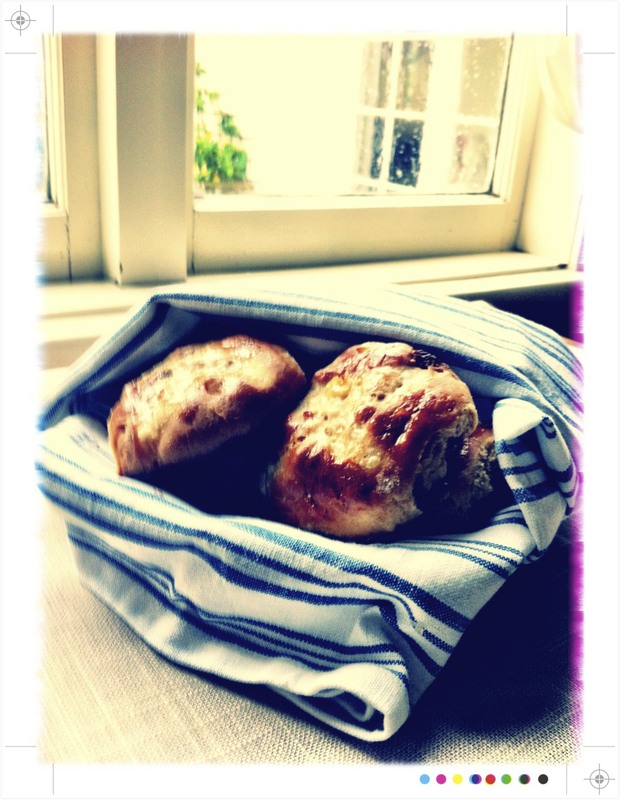 With a knife score each bun with a cross, cover with a lightly floured tea towel and leave to rise for a further 45 minutes or until they have double in size. While they are rising preheat the oven to 220C/425F. Once the buns have risen brush then with the egg wash. For the crosses mix together the flour, sugar and water in to a thick paste. Dribble the paste in the indents on the buns and place them in the oven for 15-20 minutes until they are golden and cooked through. Remove the buns from the oven and place on a wire rack to cool. 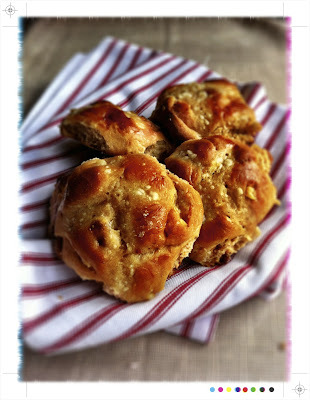 Mix together the sugar and water and brush over the still warm hot cross buns. 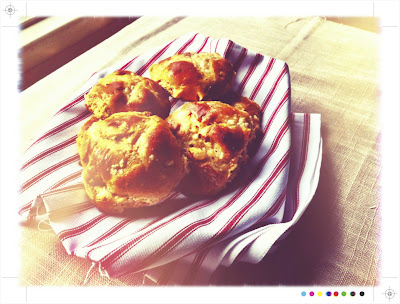 Don't wait any longer, grab one, slather with butter and enjoy! The spelt flour seems to makes these a little lighter than the bought variety which I quite like and makes me feel less guilty tucking in to a second one! 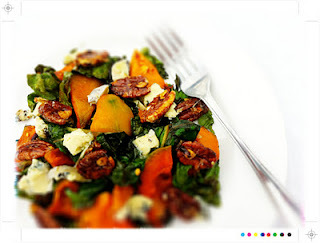 These are a little fragrant and aromatic from all the spices and the orange zest adds a lovely bright note. 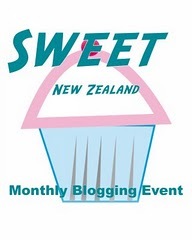 This is my entry in to this month's Sweet New Zealand being hosted, this month by the lovely Emma over at My Darling Lemon Thyme....thanks for hosting! 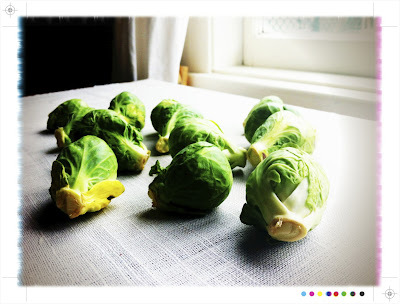 I couldn't resist picking up some of these Brussels sprouts at the grocers, maybe I felt a little sorry for them since they get such a bad rap. I guess for many of us it childhood memories of them boiled to death, water logged, bitter and odorous. They produce hydrogen sulphide when heated, and it only increases the longer they are cooked, not good. 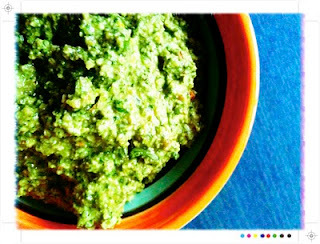 However if not over cooked they can be quite delicious, a little nutty, a little sweet and full of green goodness. 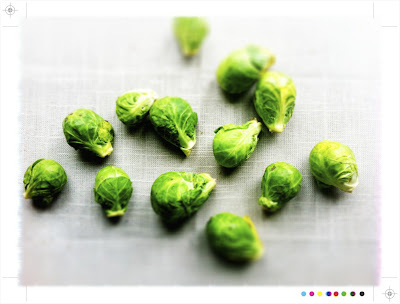 Just to note my Mum never did over cook her Brussels sprouts. When they would make their annual appearance at the Christmas table they were gently cooked and tossed with walnuts and bacon. Thinking back that is likely where the inspiration for this dish came from. And I do reckon that done this way I could convert some of the Brussels sprouts haters in to lovers, heck if you didn't tell them that they were Brussels sprouts they may not even guess that they were eating the much maligned little vegetable. 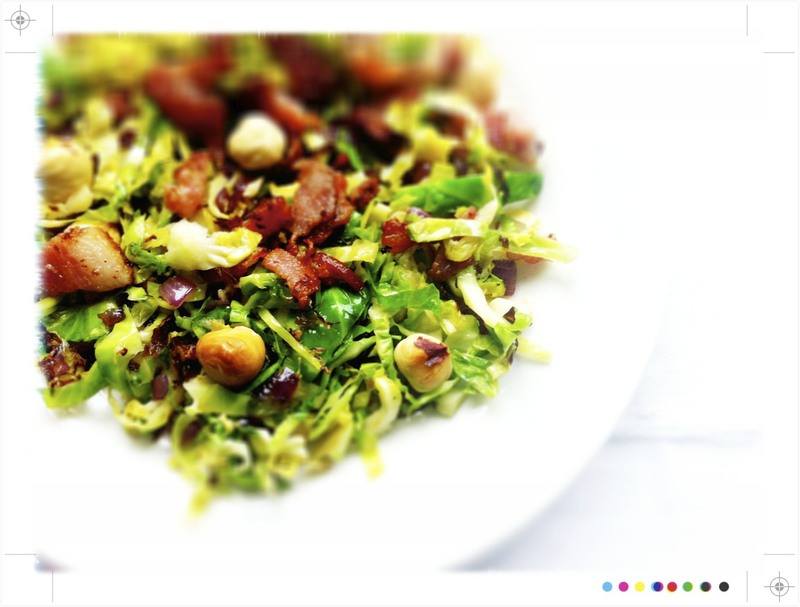 Lightly sautéed with onions and garlic, tossed with toasted hazelnuts and crispy bacon Brussels sprouts are as far removed from those childhood horrors as you could possibly imagine, they are something else entirely. So even if you are a skeptic go on and give Brussels sprouts another go as I am quietly confident that you will be pleasantly surprised. 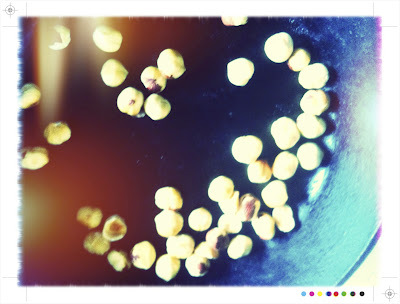 Toast the hazelnuts for just a few moments and set aside. In a large frying pan heat the olive oil over a medium heat. Add the red onion and garlic, season with a little salt and sauté for a few minutes until translucent. Add the Brussels sprouts to the onions and garlic and sauté for a few minutes until the Brussels sprouts are just cooked through but retain a little crunch. Meanwhile in a separate pan fry the bacon until it is crisp. Add the hazelnuts and bacon to the Brussels sprouts and serve immediately. The light sautéing leaves the sprouts bright and green with a little crunch, no sign of bitter or mushy here. 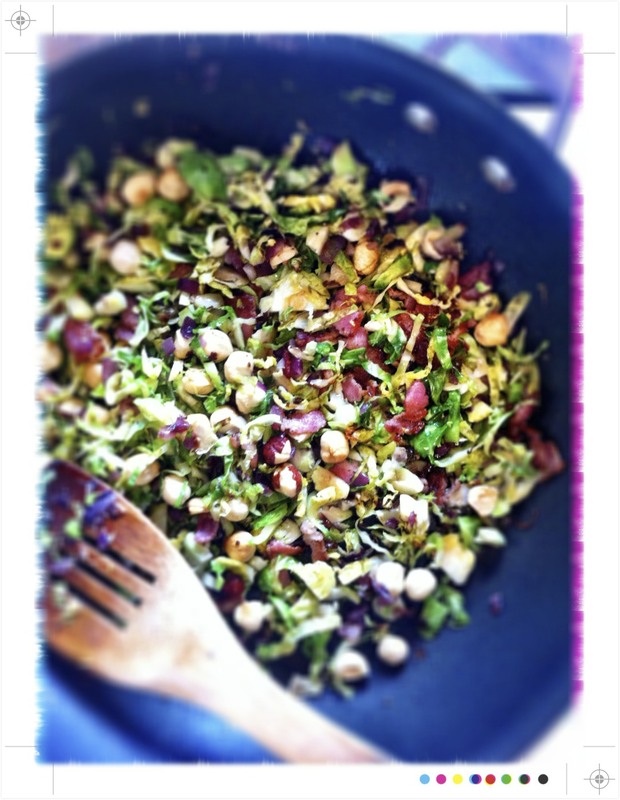 The toasted hazelnuts add an additional nutty note and a little crispy bacon adds the salty and the crispy. 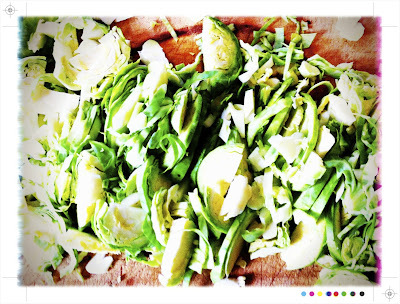 All lightly enveloped in olive oil this is a bright, tasty side full of texture and layers of flavour. A relaxing weekend and I so enjoyed being back in my kitchen, I have missed it these last few weeks. For me it is my little haven of comfort and that led me to the need to bake. 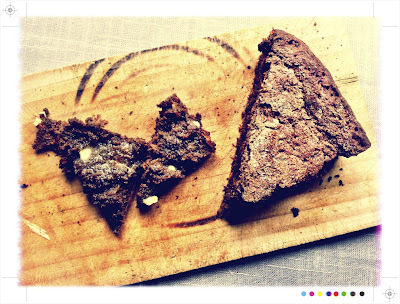 Looking at my ever-growing list of things I want to make this Black Bread jumped out at me and straight to the top of the list. I had spotted this Black Bread on Heidi Swanson's blog 101 Cookbooks back in January. 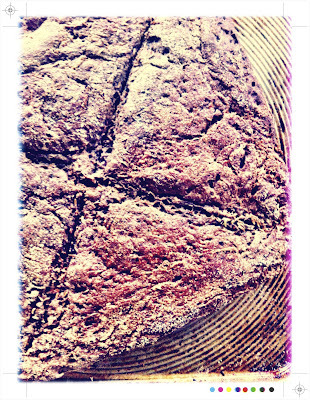 I am a fan of just about any bread but this one seemed quite special the ingredients including cocoa powder, coffee, caraway and molasses. My first attempt was more of a flat bread, though still delicious. 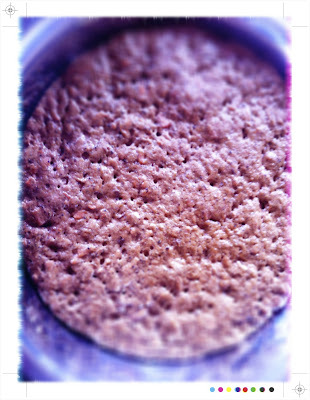 My dough did indeed double in size just out and all over the tray rather than up! So my second attempt I used a deeper dish to allow the rising in the right direction. 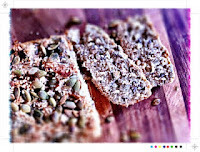 The first time round I used honey and it does make for a slightly lighter less rich bread. Second time I went with the molasses and it delivers a wonderfully richer and darker bread. This does make quite a large loaf, actually very large loaf, so next time, and there will definitely be a next time, I think I will make 2 smaller loaves. 2 carrots, coarsely grated. You want about 2 cups of carrot. *I found 320 ml to be ample and even added a couple more tablespoons of flour as it was quite a sticky dough. In a small bowl whisk together the yeast, warm water and sugar. Set it aside until the yeast blooms and becomes foamy. If in doubt start again as no blooming will result in a potentially dangerous missile rather than a delicious loaf of home baked breads. I learnt that last year with my dismal attempt at hot cross buns that were more rock cakes, literally. 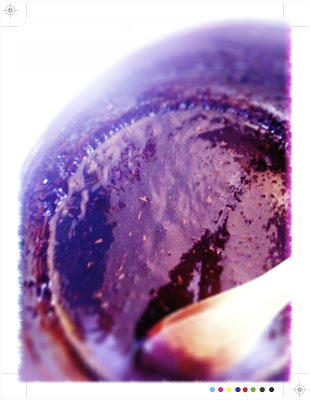 While the yeast is working its magic add the cocoa, coffee, molasses, caraway, butter and salt to a small saucepan. 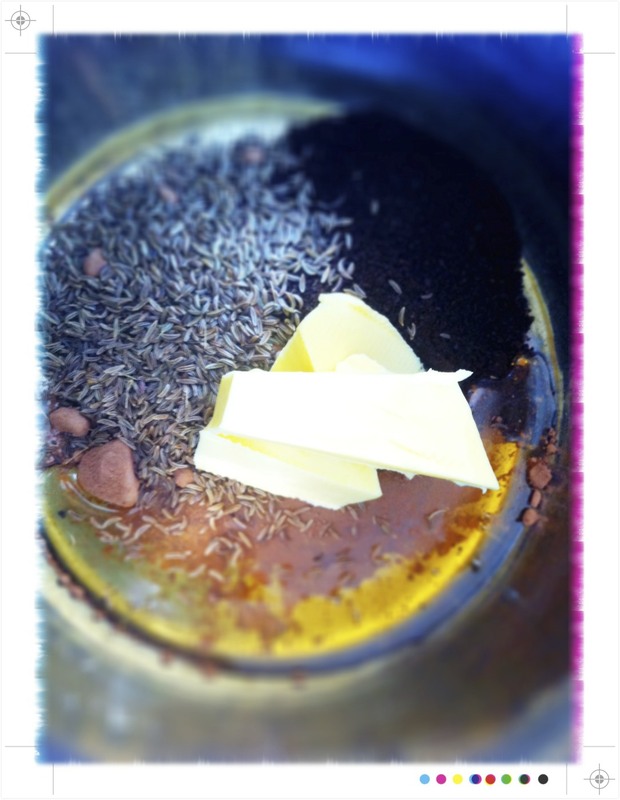 Gently melt the mixture over a low heat, it should be lukewarm when added to the other ingredients. In a large bowl, or the bowl of mixer, add the carrots, the yeast and molasses mixture. 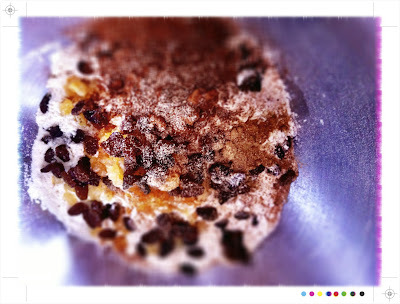 Mix it all together and then add the flours and stir until you have a quite soft sticky dough. My dough was a little too sticky so I added another couple of tablespoons of flour. If your dough is too dry add a little more water. At this point you can turn the dough out on to a lightly floured surface and need for 5 minutes or you can do it with the dough hook on your mixture. After 5 minutes the dough should be quite elastic. Gently shape the dough in to a ball and rub it with a little olive oil. Place the dough seam-side down in to a large oiled bowl. Cover the bowl and place in a warm spot for 1-2 hours until the dough has increased in size, at least half as big again. 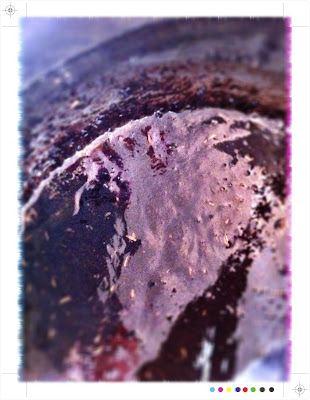 Gently press down on the dough with a closed fist and then turn out the dough in to an oiled baking tin. I used a 9" square 3" deep dish. Cover it loosely with a floured tea towel and pop it back in to its cozy corner to rise again for another hour until it has doubled in size. When it has risen, brush the dough with a little milk or water, sprinkle over a little flour and scatter a teaspoon of caraway seeds. 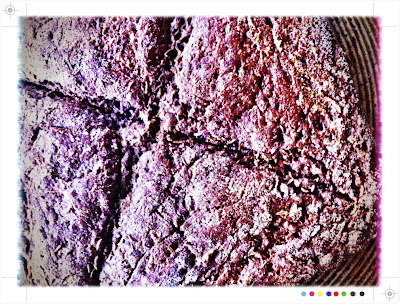 Gently cut a cross in the dough, gently as you don't want to deflate the loaf. Place the loaf in a 220C/425F pre heated oven for 20 minutes and then turn the heat down to 180C/350F and bake for a further 20-25 minutes until the bread is cooked through. Tap the loaf and if it sounds hollow it is ready. Remove the bread from the oven and let it cool on a wire rack, if you can, I couldn't. I can't go past bread straight out the oven, butter melting. 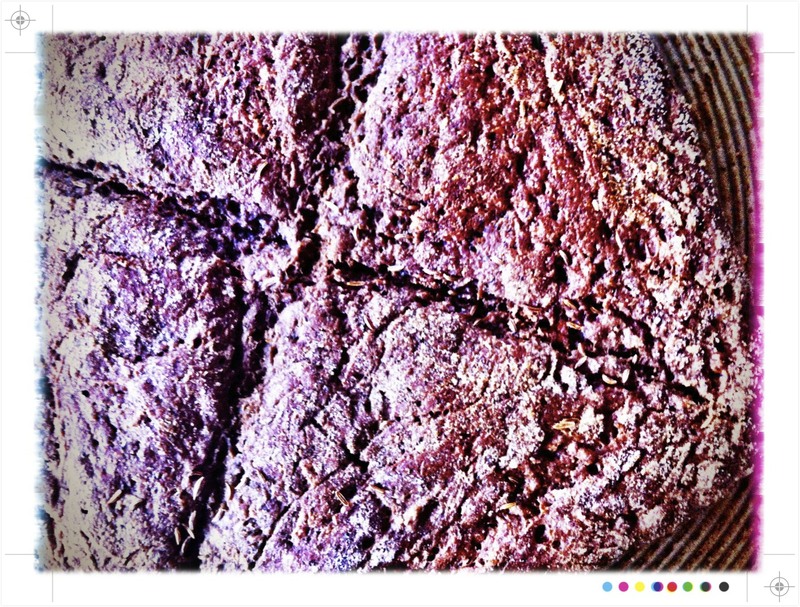 This bread is quite wonderful, not for the faint hearted it is rustic and most definitely not shy. 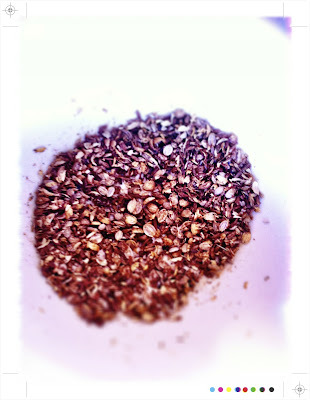 Using the molasses, rather than honey, adds a real dark treacly richness and depth of flavour that is then spiked with caraway. It is perfect just with butter but I think I will be taking Heidi's recommendation and having it with a little grilled cheese for lunch. 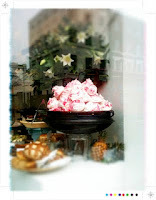 I had a wonderful weekend in Melbourne; catching up with friends, eating, drinking and even a little time for shopping. I am already planning my next trip back. I finally made it to the renowned MoVida and it didn't disappoint. 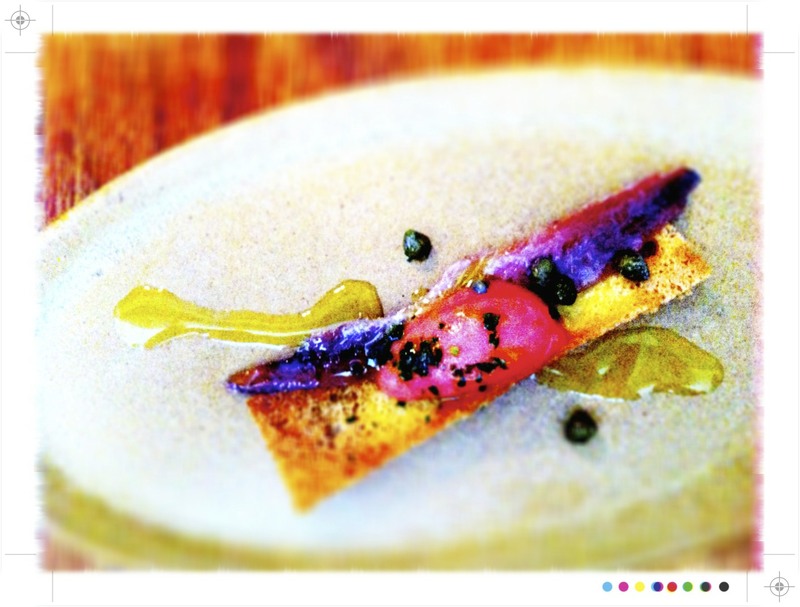 To start…cava (of course) and Anchoa (Hand filleted Cantabrian Artisan Anchovy on Crouton with Smoked Tomato Sorbet). 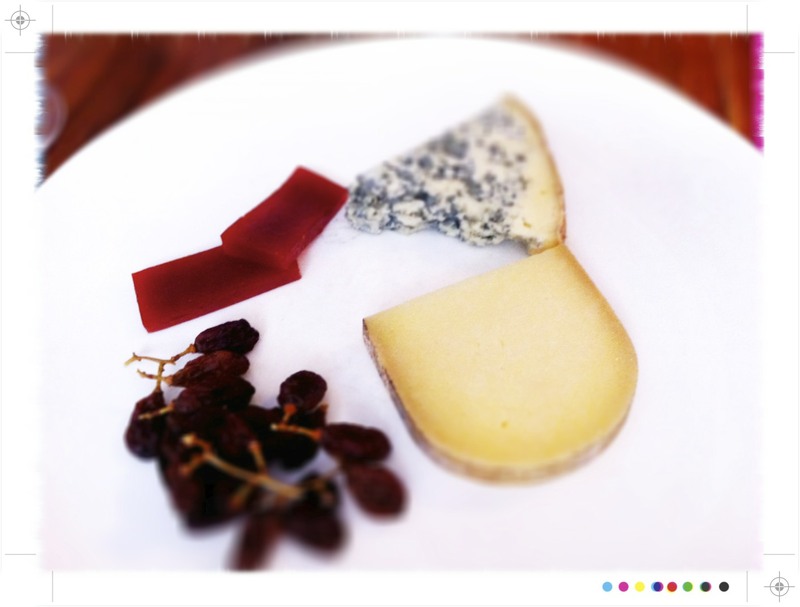 And what a delightful little morsel to start with. Crispy crouton, salty anchovy and then that smoked tomato sorbet oozing with such a wonderful smokiness; it was incredible. 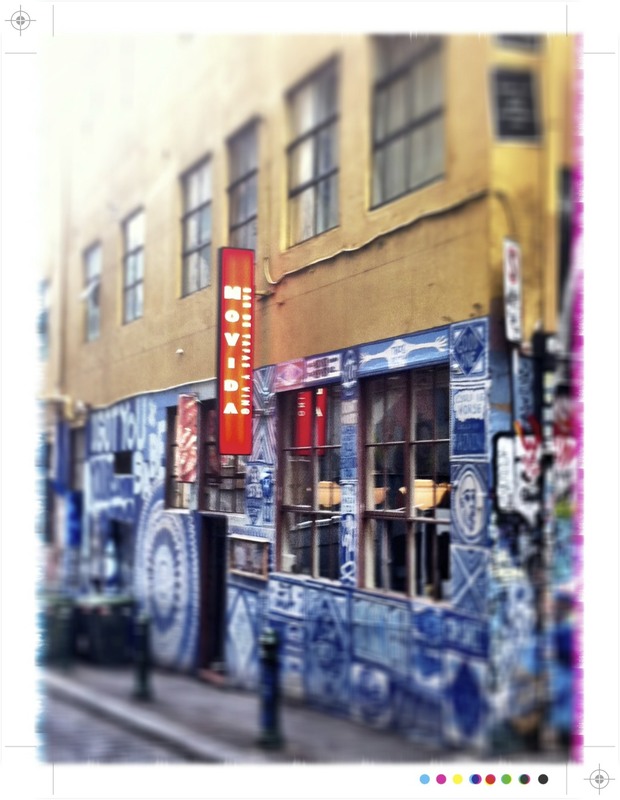 An exceptional start to an exceptional meal, yes I loved MoVida. What could be better than hanging out with good friends with amazing food and some cracking Spanish Tempranillo? Plus our waiter; knowledgeable, informative and hilarious! He certianly kept us in line. 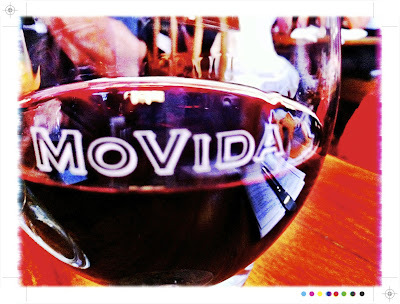 MoVida's reputaton precedes it and isn't it wonderful when such high expectations are blown out of the water? 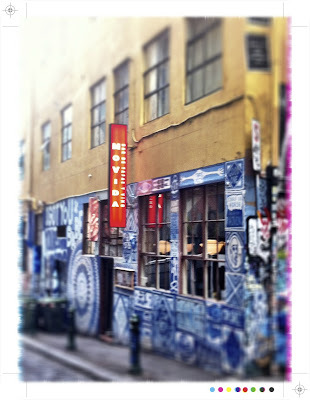 MoVida opened it's doors back in 2003 on the graffiti covered Hosier Lane in the heart of Melbourne. Tapa and raciones are it's thing so it was well ahead on the trend of small plates and sharing. Me I love the small plates and sharing as it means you get to try everything! Lunch was made up of little bite sized tapa to start followed by a few raciones or larger sharing plates. After the first tapa there was a lot to live up to. The first one was my favourite. 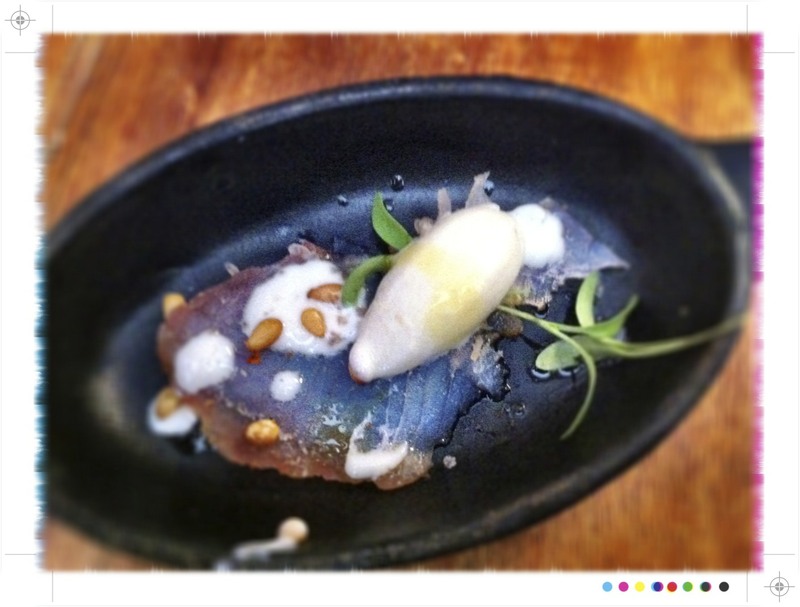 The Caballa Ahumado (House Cold Smoked Spanish Mackerel with Pine Nut Gazpacho Sorbet) was light and delicate, the creamy, nutty sorbet perfect with the delicately smoked mackerel. 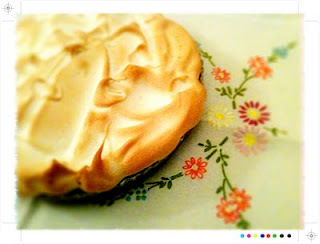 Not to mentions the incredibly cute little cast iron dish it was presented in. 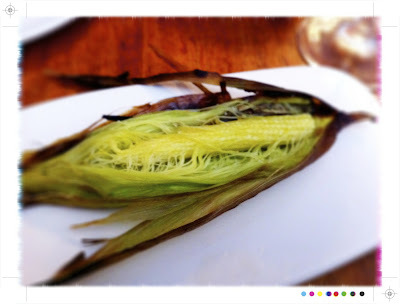 Next for me was the one of the specials, baby corn roasted in it's husk. Simple yes, but simple is often best when it comes to food and this was sweet with a hint of roasted smokiness. 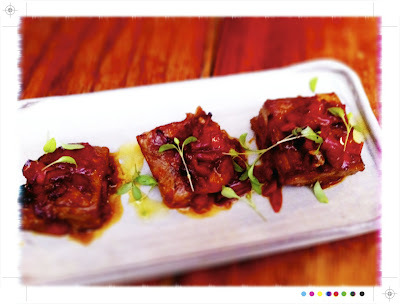 To finish of the tapa Cordero Al Chilindorn (Pyrenees Wet Roast Lamb Breast with Fino and Paprika Sauce). Melt in your mouth lamb, sherry and paprika the perfect counterparts. 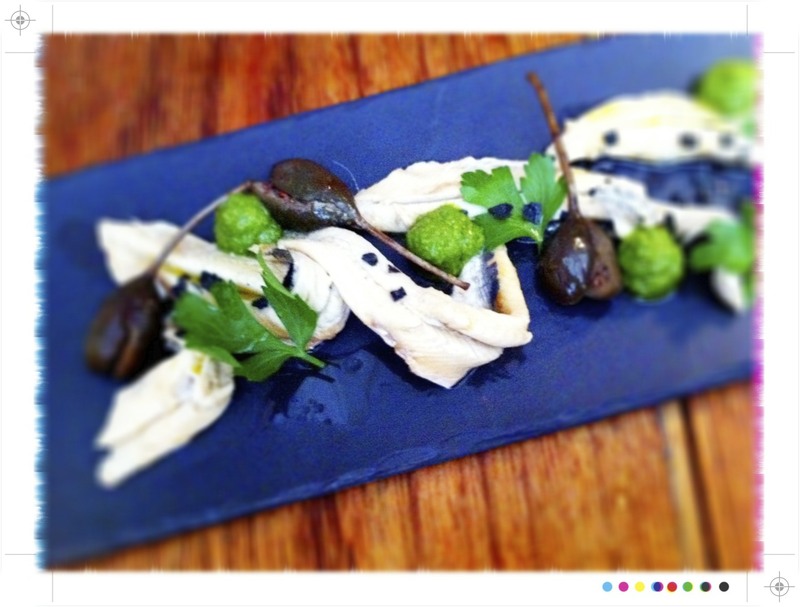 On to the raciones and Boquerones (Marinated White Anchovy, Caperberry and Parsley Salad). 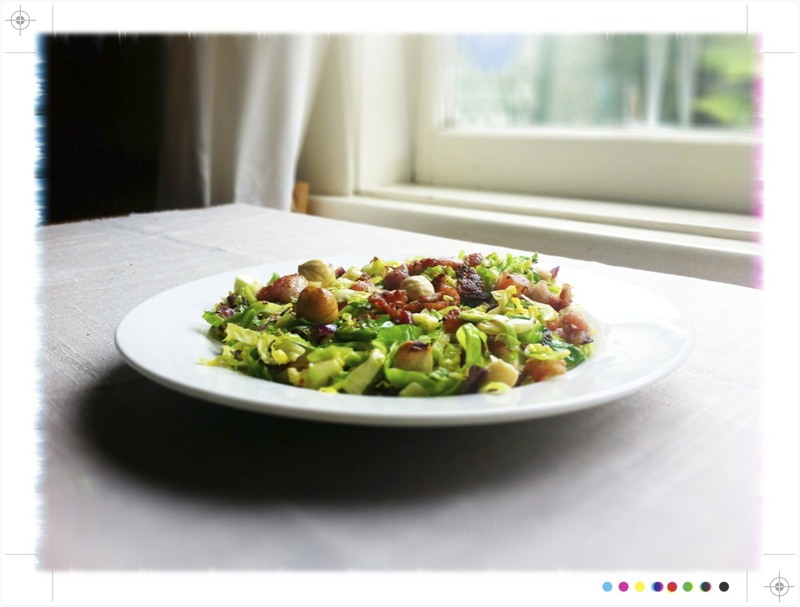 This was my pick as I have become a lover of white anchovies since having this salad and matched with caperberries and parsley it made for a fresh, sharp salad. If anyone knows where I can get some white anchovies please let me know. 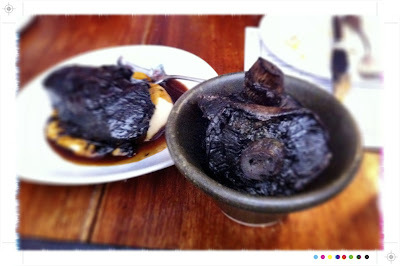 On the side some Puerros (Slow Cooked Baby Leeks with Butter and Garlic) which were melt in the mouth. 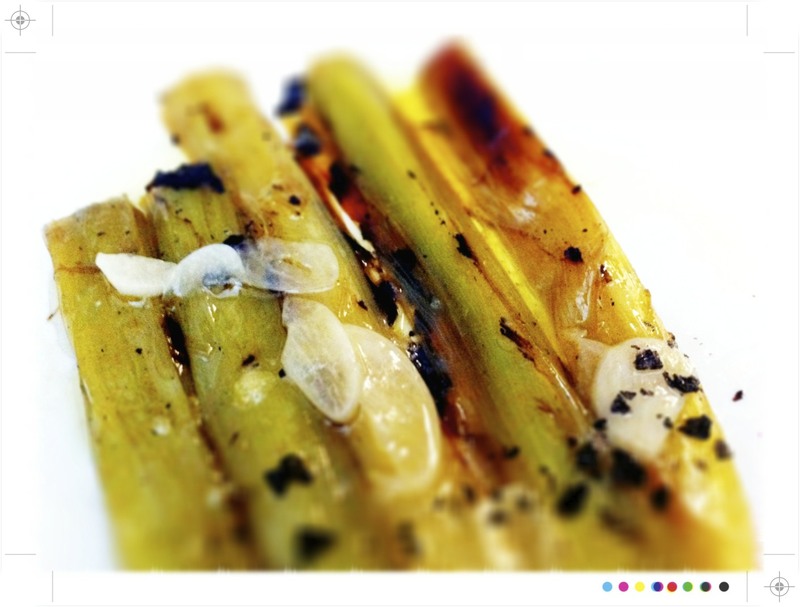 Slow cooked leeks that had then a little time on the grill to add a little char grill smokiness. 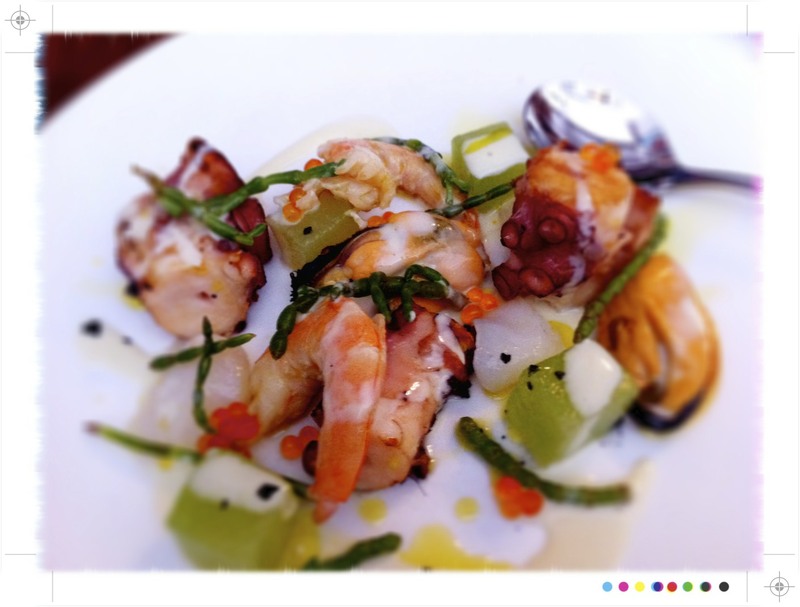 For a little salad we ordered the Salpicon (Fresh Seafood Salad of Octopus, Prawn, Scallop and Mussels). I am not usually a fan of octopus but this was cooked perfectly, so tender. Along with prawns, scallops and mussels a little seafood feast accompanied with little cubes of melon that had been marinated in wine vinegar. To finish off this veritable feast Carrillera de Buey (Slowly Braised Beef Cheeks in Pedro Ximinez on Cauliflower Puree). MoVida cleverly go from light to heavier dishes. This was one of the table favourites of the day. 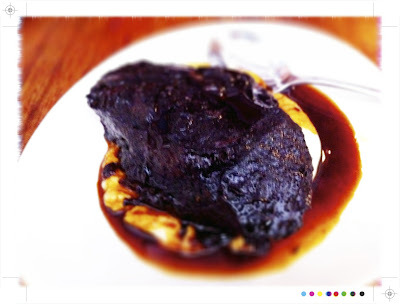 So wonderfully rich and meaty, yet meltingly tender atop a creamy caulifower puree. Cauliflower is not my favourite vegetable but when it is pureed it transforms in to this silky smooth creamy essence of cauliflower which is something else entirely. We also couldn't go past the Seta Asadas Con Jerez (Oven-roasted Portobello Mushrooms Finihsed with Sherry Vinegar) again simplicity proving to be the winner, so incredibly simple but so wonderfully delicious. Meaty, earthy mushrooms and a little sweet acidity from the sherry vinegar, it couldn't be any simpler. 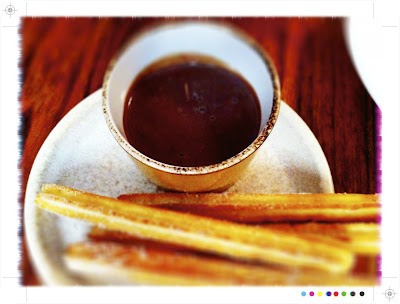 And to finish a little cheese and membrrillo and of course we couldn't go past the Churros…one can never go past churros. Most deinifnelty up there with the best lunhces ever had. 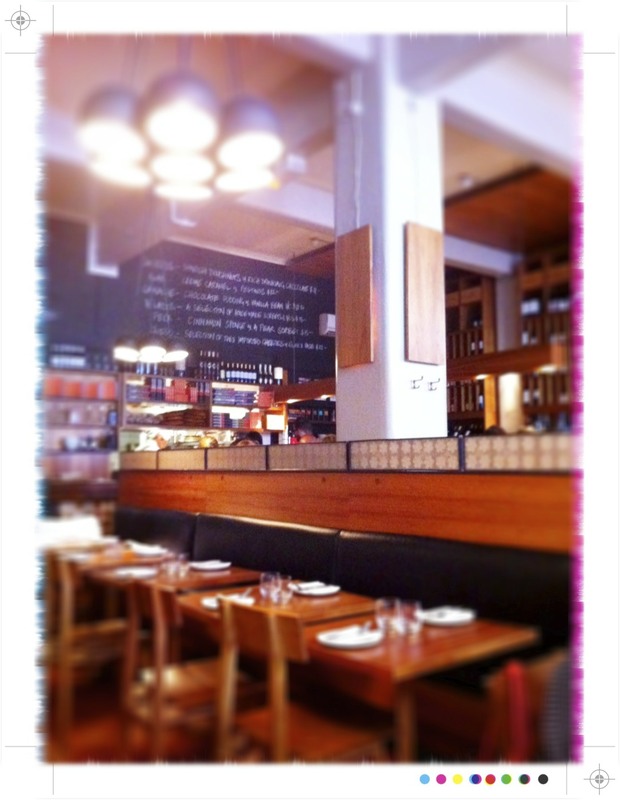 The put it perefectly the spirit of Spain in the heart of Melbourne. 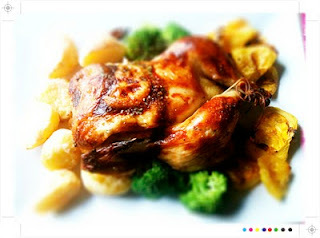 If you love good food you will love this give away. Nespresso is launching their new coffee machines; the Maestria and the Grand Mastria; and to celebrate the launch they are hosting a what will be a fabulous degustation menu specially designed by rising star Nick Honeyman. 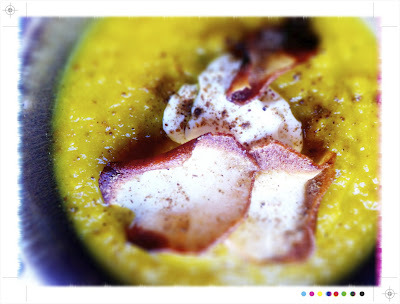 Nick is designing a degustation menu which incorporates the flavours of Nespresso coffee. The dinner is next Wednesady 21 March at 6:30pm at a yet to be disclosed Auckland city location and the lovely people at Nespresso are inviting one of you to come along. 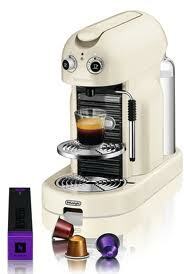 If you want to make coffee like a barista at home then the new Nepsresso Maestria could be the machine for you. Not only will you get the perfect cup of coffee every time, you will have a gorgeous retro looking Maestria sitting on your bench. I know us Kiwi's can get quite particular aout our coffee and the Maestria delivers on that front too allowing easy adjustment of the amount of coffee. 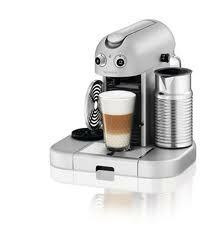 If you like frothy milk, no problem there's a handy steam wand on the side. And what I like about Nespresso is that you can choose your coffee from one of their 16 grand crus, whether you like espresso, dark roasted or even decaffienated, there is something for every coffee lover. Not only that they have a real focus on using coffee from sustainable sources and have a collection scheme to recycle used capsules and that is before we even get on to their spokeperson George Clooney…. The Maestria and Gran Maestria they will be available from April 1st, 2012. So back to that give away, you will need to be in Auckland (sorry out of towners and out of New Zealand readers) on Wednesday 21 March and available to make your way to dinner at 6:30pm at an Auckland City location TBC. If you would like to be in with the chance to come along; to what I have no doubt will be an amazing dinner, please leave a comment below. (1 entry per person!) I will randomly draw the winner at 8pm Monday 19 March. Good luck!